I’ve been to Montreal twice, and both times the top things on my to do list wasn’t about poutine. No, I needed to grab me some Montreal smoked meat (Schwartz’s) and some Montreal bagels (St-Viateur’s). Unlike New York bagels (which I’ve also had) or bagels from anywhere else, Montreal bagels have this magical and mystical quality about them that can be a bit hard to explain. I’ve found that people only truly understand after they’ve tasted some. Montreal bagels are smaller than most other bagels. They’re also quite dense, have a slightly sweeter taste, and are baked in wood-fired ovens. I’ve known people to specifically ask travelling friends to bring back bags of bagels, and then promptly hoard them in their freezers. The taste is quite unique and is hard to find in the West. So imagine my glee when I saw a sign at the City Market downtown farmer’s market declaring “Montreal Style Bagels” for sale! Unfortunately, they were sold out that day, but I made sure to go back another week in the early morning to make sure I could grab some. Visually they looked quite good. The holes on some of them probably could have been a little bigger, but I figured that was just being too picky. The texture was great – dense and chewy, although a touch dry. The smell was definitely there – smoky and a little sweet. But the taste. Oh the taste. It was SO close, but not quite. The bagels were slightly sweet like they were supposed to be, but these ones are not baked in a wood-fired oven and instead are flavoured with liquid smoke. I personally didn’t care for the liquid smoke taste, so have ultimately decided to do without rather than settle for something not quite right. But if you’re craving Montreal bagels and can’t afford to have them shipped from Montreal, this is probably your best bet in Edmonton. P.S. 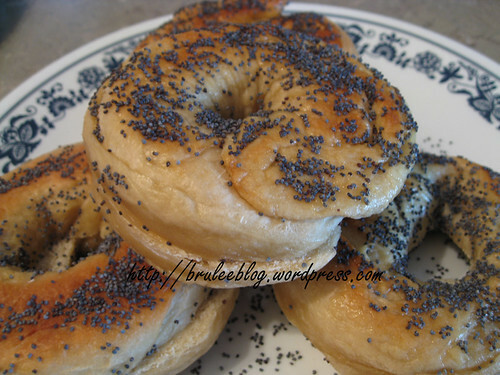 I have heard of a place in Calgary called Montreal Bagels that I’m dying to try. Apparently the baker used to work for either Fairmount or St-Viateur’s in Montreal, and they’re baked in a wood-burning oven. Montreal Bagels is right by my house. And my friend from Montreal says they are the closest she’s come to real in town. We love them! PS I finally got the pyrohy supper schedule out of my mom. It’s late notice, but tomorrow night is the first one at Holy Cross on 153rd Ave. But thank you for the info! Montreal bagels are the absolute best in the world!! My favorite bagel shop in Montreal, which is far superior to St.Viateur, Fairmont and any other shop..ships to anywhere in the world!! Check out my blog to read about some of their other products. I love this place as well as Montreal bagels!